Are you pining for 2003? Starting at this link is the first time Bo worked as a mall elf for the holidays. I took a few days off for the holiday and when I returned to all things bloggy, I found that Bo Nanas Sunday strips are now rerunning on Fridays. Well, last Friday at least. We’ll see if it holds. If you remember there was no Sunday the week before, possibly because a whole series of “Bo as mall elf” strips were rerunning (and still are.) This Sunday is holiday themed and strikes a bit too close to home. Our Christmas lights are still up. I’ve using the “we had a kid” excuse for a while, but it’s starting to look flimsy. Y’know what’s weirder than having Sunday strips rerun on Saturday? It’s when they don’t. Not sure why. Perhaps it has something to do with with the Christmas strips that are rerunning right now. (You heard that right.) Click here and follow Bo as he becomes a substitute Santa. Well, it is over at GoComics.com where the calendar is more of a suggestion than anything else. The next few weeks of strips are my take of “Twas The Night Before Christmas” starring Bo and the surly mall elves. And I wanted him to have some co-workers. One of the first gags was about their names not being elfish names like “Jingles.” But what names to give them? Well, I have a bunch of friends with normal but cool names – Gavin, Ian, Nigel and Omri (OK, the last one is out of the ordinary) – why not use them? And not just their names, but their faces as well? So I added their features onto my standard elf oval-shaped head a la Mr Potato Head. (You can see them all here. From left to right – Nigel, Gavin. Omri and Ian.) The boys loved it. My plan was to do the Mall Elf thing every holiday season. The first year was just random mall/elf/kids/shopping gags with no real theme. The second was about a mall day care (rerunning right now). In the third all the elves and Santa got sick so Bo had to be Santa. For the last year of the strip I did an elf strike (with elf strike breakers and everything) told as a version of “Twas the Night Before Christmas.” That’s four years. I’m not sure how much longer I could have done it without it becoming tedious (if it hadn’t already). 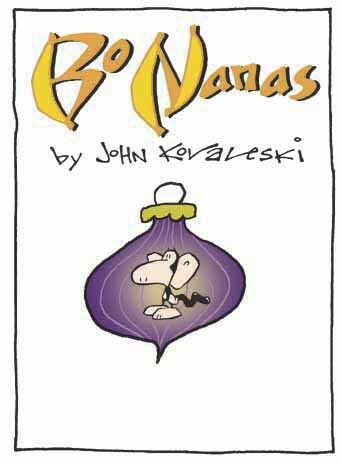 Remember back a month ago when I mentioned a strip that may have been the only “Bo Nanas” strip that didn’t show Bo? Well, it almost happened again in the Christmas Elves/Mall Daycare storyline rerunning on Gocomics.com. The strip that’s on the site today was the revision – the original is above. My editor thought, rightly so, that it had “child abduction” stamped all over it. So I added Bo in the first panel (and dropped the third “pause panel”) so it would be clear what was going on. The Christmas season has begun at Gocomics.com. Today they’ve started rerunning “Bo and The Mall Elves and The Adventure of the Day Care Center” from a few years ago. Will they notice it and skip ahead like they did with the Halloween series? Or not notice it like they did with the Thanksgiving/Petting Zoo series? The suspense is nearly unbearable. The Sunday strip up on Gocomics.com today is one of those let’s-make-one-big-panel ones. This was impossible in the “olden days” of comic strips. Back then (which I don’t think was so long ago really) you would do the Sunday strip in three tiers, with specific breaks in the tiers so the whole thing could be reformatted as the newspaper wished. And the first tier had to be disposable. (You can see diagrams and explanations here, if you’re into that kind of thing.) I actually started doing my Sundays this way and, I’ll tell you, it’s a challenge to write a gag that has to have panel breaks in just the right places. I was very happy when I started doing the big-panel-that-I-can-cut-up-any-way-I-want-with-a-drop-panel-that -I-really-have-nothing-to-say-about …like the one below.